There are various methods to gain an understanding of the structure of plant cells. 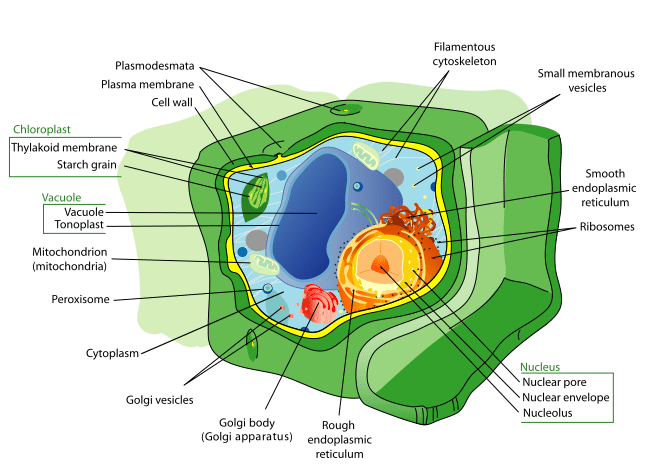 Constructing a 3D model of a plant cell is an excellent way to familiarize yourself with them because then you can visualize the component parts of the cell. This is one of the reasons that 3d cell projects are frequently assigned to high school classes. 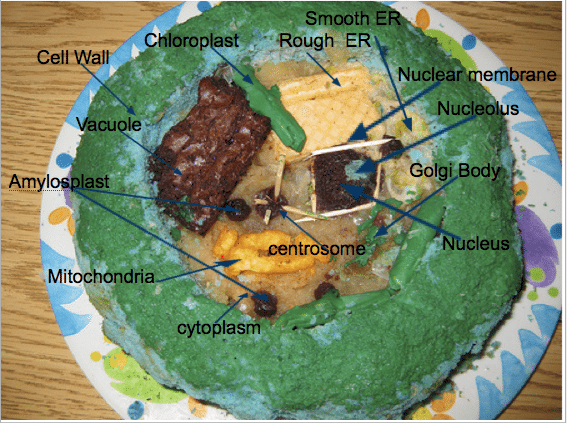 Whether you are creating a 3D plant cell model for class or for your own enjoyment, you can use various materials to construct the model of the cell. This guide will provide you with some ideas of common household objects you can use to represent the various parts of the plant cell as a sort of home science project. 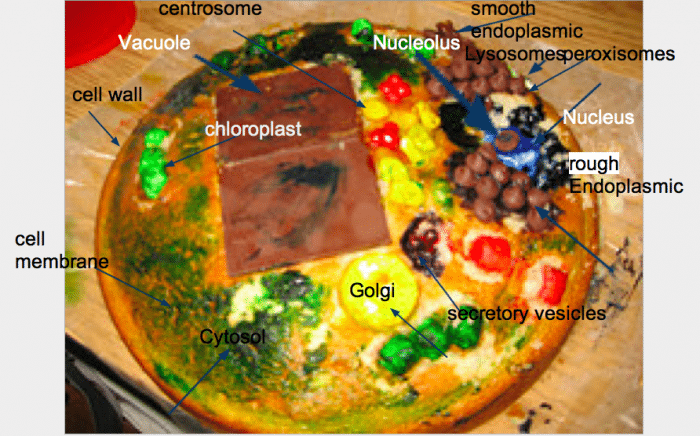 When creating the plant cell model, you can start with the cell wall and then work inwards to cover things like the cytoplasm, the nucleus, and the endoplasmic reticulum. The cell wall is what surrounds the entire plant cell. Cells walls are only found in plant cells, animal cells lack them. The cell wall helps give structure, protection, and rigidity to the cell. The cell wall of a plant cell can easily be represented with some cardboard. In fact, a cardboard box can be used to represent the entire outside of the cell and the opened area of the box will represent a cutaway where the interior of the cell can be seen. Within the cell wall is the cell membrane. The cell membrane keeps the cell’s contents within it and also isolates the cell’s interior from the outside environment. The cell membrane is found within both plant and animal cells, and it’s composed out of a phospholipid bilayer. The bilayer construction means that there are two lipid layers that face in opposite directions. There’s a hydrophobic phosphate head and a hydrophilic fatty acid tail. This arrangement helps control what moves in and out of the cell. You may want to simply use some colored cellophane or a similar item as the cell membrane and connect it to the interior of the box, since the cell membrane is quite thin. The cytoplasm within the cell is a gelatin-like liquid that fills up the space inside of the cell. The cytoplasm’s composition is mostly water, yet there are many organelles and various substances found floating around within the cytoplasm. The cytoplasm also has filaments within it that give some extra stability and structure to the cell. Since the cytoplasm is a liquid, and somewhat hard to model, you may want to simply paint the interior of the box a different color to represent the cytoplasm. The nucleus of the cell is often dubbed “the brain of the cell” or “the control center of the cell”, and with good reason. This is because the nucleus controls many of the functions of the cell. The nucleus is also the largest part of the cell found within the membrane, aside from the vacuole. The nucleus contains the cell’s DNA and is responsible for replication and growth. The nucleus has a smaller structure nested within referred to as the nucleolus, which produces ribosomes. Nuclear pores are what let the ribosomes exit from the nucleus out into the rest of the cell. A small styrofoam sphere placed within the box can effectively represent the nucleus. The vacuole is an organelle found in plant cells that help the cell maintain its shape by regulating turgor pressure. Plants have multiple vacuoles, but there is one main vacuole that is substantially larger than the others. The vacuoles in plant cells are quite large, and this can be represented with a cutout of blue foam or cloth. Mitochondria are structures responsible for carrying out cellular respiration. They provide energy to the cell by breaking down sugars and complex carbohydrates into simpler forms, which the plant can then use. For this reason, they are frequently referred to as the powerhouse of the cell. The mitochondria can be represented by objects like bottle caps or Legos. They should be smaller than the nucleus, though not as tiny as the ribosomes (see below). Peroxisomes are responsible for breaking down fatty acids into simple sugars. To do this, they have oxidative enzymes within them that break the assets down into their component parts. The peroxisomes also play a role in photosynthesis and assist the chloroplasts in converting sunlight into energy. Much like the mitochondria, the peroxisomes can be represented by smaller items like erasers, peanuts, or bottle caps. Ribosomes are what the nucleolus creates. They mainly contain ribonucleic acids (RNA) and are used in the synthesis of proteins. Some of the ribosomes can be found freely floating in the cytoplasm of the cell, but most of them will adhere to the outside of the endoplasmic reticulum. Ribosomes are much smaller than the other organelles of the cell, so you’ll want to represent them with something comparatively small like pushpins or perhaps just tiny globs of paint. The Golgi Body (sometimes referred to as the Golgi complex or the Golgi apparatus) is responsible for transporting various materials in and out of the cell. Some of these materials include lipids, which are packaged and transported outside of the cell. The Golgi body is sometimes dubbed that the post office of the cell because it readies proteins for distribution and then sends these proteins out to the where they are used to carry out various functions. The Golgi body is made out of different cisternae and sacks, and the sacks of the Golgi body can be represented with rubber bands or pipe cleaners. Chloroplasts are a type of plastid, and they are filled with a pigment known as chlorophyll, which gives the cell its green color. The function of the chloroplast is to trap the energy found in sunlight and convert it into usable chemical energy for the cell. This process is referred to as photosynthesis. Small green Legos or buttons can be used to represent the chloroplast. The endoplasmic reticulum is made out of a complex system of sacs and cisternae, and its function is to synthesize proteins for use by the cell. The endoplasmic reticulum is divided into two sections, the rough endoplasmic reticulum, and the smooth endoplasmic reticulum. The rough endoplasmic reticulum is called “rough” because it is covered in ribosomes. The smooth endoplasmic reticulum lacks ribosomes. Pipe cleaners linked together can represent the endoplasmic reticulum.